Everyone who is on the first delivery has been called or e-mailed a receipt. I am working on the second delivery now. Right now the bees are in the upper box. The queen has been laying for a while now. There is brood in the colony now. Maybe on one frame at the moment. The queen will be increasing egg production and the brood nest will start to expand to several frames over the next month. Food consumption will rise with the now expanding frames of brood. Now with the temperatures in the 30's would be a good time to check food stores. I like to lift the top box up to see what the weight is. If it is very light, starvation is imminent, I would feed syrup if they are at this point. If they still have some decent weight I hold off feeding for a couple more weeks. Pollen patties will be going on by the second week of March. I have seen and heard some signs of spring. Driving home from work I have noticed Willow trees. Their branches have turned very yellow and are easy to spot with the snowy landscape backdrop. Also, the Chickadees have started their feebee calling. This usually starts in February and always tells me that spring is right around the corner. A fellow beekeeper from White Bear sent me this link. The wonders of bees never ceases. The last cold blast could have been a colony killer. There is brood in the hive right now. The bees won't leave the brood, so starvation is a concern. If the bees were alive last week a new check is a must because their status may have changed. I suggest if anyone is still ordering bees to do so now. My second load is filling very quickly. 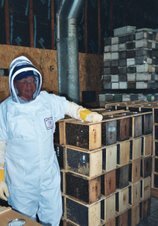 Veteran beekeeper and entomologist Dan Palmer will provide all the information necessary to keep bees in cold climates. He'll take you through two years of beekeeping, from purchasing and assembling equipment and bees to producing and selling honey. The course is geared toward beginning beekeepers in a two-session series. First session Sat. March 2, 9:30 am - 4:30 pm. The second session occurs Saturday, April 20 from 9:30am-4:30pm. You must attend both sessions in order to participate in the workshop. Reservations required. The package bees are in high demand. Don't wait too long to order if you need bees. A beekeeper needs to check the bees now, to see if they are alive. Waiting for warmer weather may be to late to order bees. Our first delivery of bees is sold out. We ran through all my numbers this morning. Most of the orders that we have here are on the first load. Some of the orders that came in the mail yesterday will be on the second load and any orders coming from now on will be on the next load. We e-mail receipts to everyone, so please read the e-mail to make sure of which load you are on. My second delivery is still open at this time. I was at Mann Lake last week and with the help of Erica, the Mann Lake Rep. We put out a video of some of their new products. This is a sneak peek, some of the items are unavailable at this time but should be coming soon. Double click on the screen for full screen viewing. Press esc to go back. A worthy project that can use some help. Watch the video. Awesome observation hive. The bear is big.